The Teacher's Corner has created a variety of patterns for use in the classroom . The majority of them were created to supplement various bulletin board ideas, but the uses for these patterns are endless. 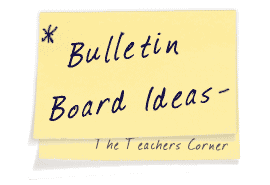 (We have provided links to the specific bulletin boards.) The patterns are organized by theme. All patterns are in PDF format. Simply click on the thumbnail, print and enjoy! If you use one of our patterns, be sure to email us a photograph of your bulletin board... we will post in on the web site! These patterns can be used on bulletin boards anytime of the year. EMAIL us your favorite pattern today!